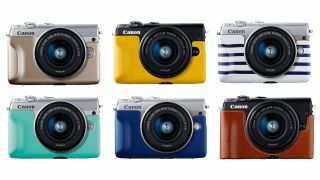 Canon has refreshed the entry-level side of its EOS M mirrorless range of cameras with the EOS M100. The EOS M100 updates the EOS M10 that has served as the most junior member of Canon’s mirrorless stable for the past couple of years. Promising "incredible" image quality, the EOS M100 arrives with a 24.2MP APS-C sensor, which is a boost over the 18MP version found inside the EOS M10, together with the familiar EF-M lens mount. With Canon’s sensor-based Dual Pixel CMOS AF system also on board, it’s likely this is the same sensor that the company has included in other recent models, and this operates over a sensitivity range of ISO 100-25,600. Joining it is the previously seen DIGIC 7 processing engine, which supports Full HD video recording and burst shooting up to a maximum 6.1fps. Creative filters are also on hand to negate any post processing, as are five different Smooth Skin options for those capturing selfies. And, with a screen that tilts all the way around to face the front, together with Wi-Fi, NFC and Low-Energy Bluetooth, this camera seems very much intended for a selfie-shooting audience that may wish to share their images immediately, as well as vloggers. The 3in LCD screen responds to touch and gestures such as pinching and swiping, while on-screen explanations are also on hand for the benefit of users that are still getting to grips with camera functionality. Everything is recorded to either SD, SDHC or SDXC media, and while there is no hot shoe for the mounting of external flash units, a small pop-up flash has been integrated into the camera’s design. There are three separate finishes to choose from, namely black, white and silver, and these can be complemented by nine different jackets in various styles. The Canon EOS M100 will be available from October 2017 in a range of configurations. Canon has set an SRP of £449.99/€569.99 for the body on its own, and £569.99/€699.99 for a kit that includes the EF-M 15-45mm f/3.5-6.3 IS STM lens. The company also plans to make two body- and double-lens kits available. One will sport the EF-M 22mm f/2 STM in addition to the 15-45mm lens and will be priced at £699.99/€899.99, while the other will include the EF-M 55-200mm f/4.5-6.3 IS STM and 15-45mm lens, with a suggested retail price of £769.99/€969.99.